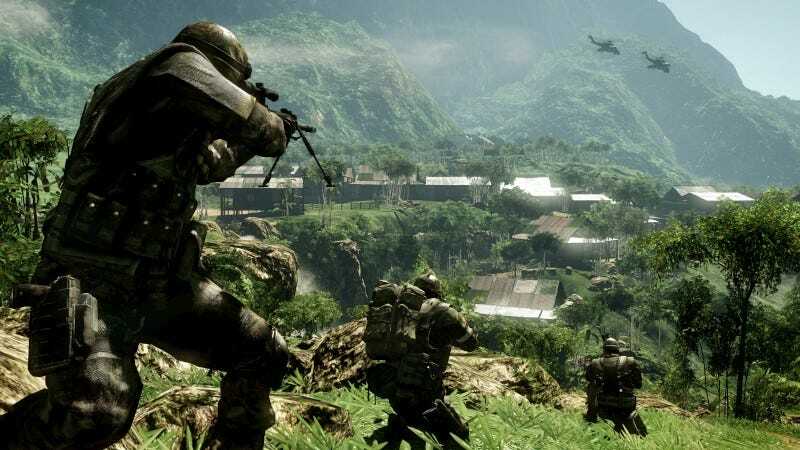 If EA wants its upcoming Battlefield: Bad Company 2 to begin wresting military first-person shooter dominance away from Modern Warfare, excellence in multiplayer is only one mission objective. How important is the campaign and can it be as good? Yesterday, I played portions of two missions from Bad Company 2's single-player campaign on an Xbox 360. The game is also being made for the PlayStation 3 and PC and will be released next month. The missions were set in Chile, first in a jungle, amid some enemy shacks, then up in the snowy Andes, approaching a satellite communications base. The impression I got is that while development studio DICE's Bad Company 2 may have the chance to be better than Infinity Ward's Modern Warfare 2 in terms of multiplayer — whoever has the best map design, multiplayer matchmaking, upgrade path and so on may claim superiority — my initial impression of the single-player is that Bad Company 2 has more of a chance to simply be different. Modern Warfare 2 single-player is a largely developer-controlled experience. It's a progression through beautifully-rendered locales, funneling players through an action movie of an obstacle course, demanding the player ride shotgun in a vehicle then shooting through a warzone, before racing across rooftops to leap to a helicopter. All while dramatic music plays. Bad Company 2 single-player feels more like it will succeed to the extent it allows player variety. What I played yesterday wasn't as beautiful as Modern Warfare 2's scenes, but it felt less canned during any instances when I was replaying a portion that I'd just died in and had to re-try. The unpredictability came largely from one of the things that is the hallmark of the Bad Company series, the ability for players and — I kept forgetting this — enemies, to blow walls up. The first mission I played, Up River, had me and and three computer-controlled squadmates fighting through a jungle, gunning our way into a ravine, down a river and then up through tin-roof one-story buildings full of enemies. You hold two weapons, grenades and a knife. I supplied myself with a machine gun and a rocket launcher. Frequently I'd encounter enemies hiding behind walls or peeking out of doorways. It took a friendly reminder from one of the game's public relations people watching me play the game, but, oh yeah, I could toss a grenade and blow up the cover. In the jungle mission, I gradually felt empowered, recalling tactics I hadn't used in a single-player game since last summer's wall-crumbling Red Faction Guerilla. Instead of waiting for an enemy to pop out of hiding, I'd blast apart the wall in front of him and there he'd be. The problem was that sometimes an enemy would do that to me. Ducking behind some sandbags to reload? Not a good choice, not all of the time. I was impressed with the enemy's ability to tear through my cover and pleased with the unpredictability with which it occurred. They didn't always knock out my cover. Sometimes I got theirs first and they went elsewhere. Sometimes I knocked down their walls. Sometimes I brought the roof down on their heads. I was worried, though, that some of the enemies seemed unaware of my presence until I was just about patting them on the back. So enemy artificial intelligence is still something to watch out for as more complete versions of this game make it to the press, to reviewers and gamers like you. The jungle level climaxed with a fight against an armored vehicle and then we got to the snow level and some computer controlled helicopter-flying. For all the talk of Battlefield's you-drive-the-vehicles advantage over Modern Warfare 2, it seems that Bad Company 2's developers will also make you ride shotgun at times. In the chopper I was introduced to the game's pacifist pilot and the more foul-mouthed protagonists of this new game. That, I was told, was an example of why the new Bad Company is M-rated as opposed to its predecessor, which was rated T. It didn't seem like a value-add yet, but I wasn't seeing much of this campaign. The helicopter sequence did add the value of letting me use a high-powered machine gun against enemy forces encamped among warehouses at the foot of a snowy mountain. Here again, the destructibility of the environment was impressive. I was able to shoot the roofs off, eliminating cover. The snow level, Crack The Sky, offered more tactical variety than the jungle level. I had to fight through some buildings, with the option to run between them, over their roofs or, my favorite, punch enough holes in them and knock enough of them down that I could forge my own varied path. Beyond that section was a controllable vehicle sequence, one that had me both driving and shooting from a Jeep armed with a high-powered gun. My buddies shot as well. We were chasing enemy trucks that were racing us to reach a crashed satellite. And in a moment that couldn't help but feel like a metaphor for Bad Company 2's pending rivalry with Modern Warfare 2, I got to shoot an enemy soldier who was riding on a snowmobile. I nailed him in mid-air as he was making a jump. As I noted above, the campaign isn't as visually impressive as Modern Warfare 2's. That's not saying much, given Infinity Ward's arguably best-in-business graphical chops. But this is, unavoidably, not quite as amazing to look at and, from what I saw, not pleasantly twinged with some of the strong use of unnatural colors that can make a Modern Warfare level look real and artistic at the same time. Bad Company 2's look, while detailed, is more conventional. Looks notwithstanding, the meaningful difference here is the gameplay. Bad Company 2's campaign looks to be the looser one, the one that gives the player more control. I'm not sure it can give the same scripted excitement as Modern Warfare 2, but it has its own thing going for it. Don't stand by a wall when you play, and keep an open mind about whether it can compete on the one battlefield that Modern Warfare 2 may have an unbeatable advantage.